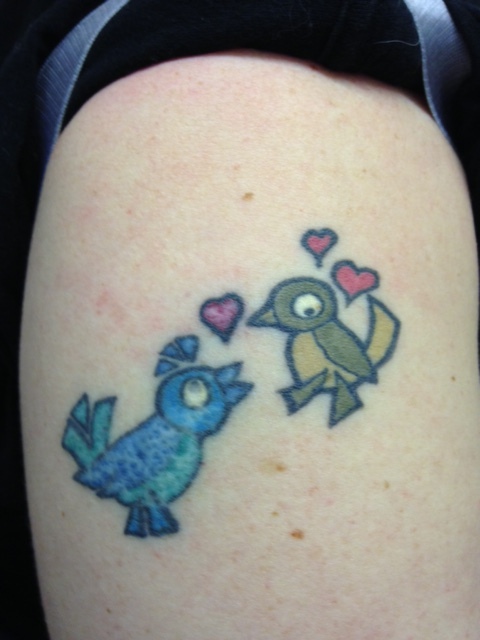 Time to start laser removal on my two little birds, I have decided what I want for my half sleeve and they unfortunately won’t fit into the design. One of the birds is also in desperate need of repairing (yes it was picked). 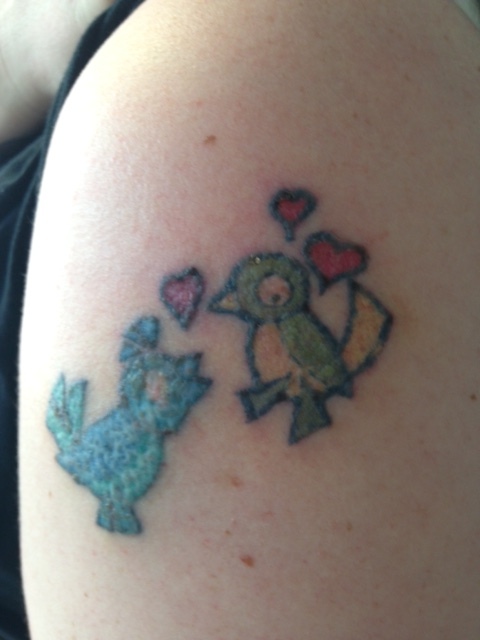 To break down the outlines of both birds and fade some of the colours for a cover-up. I am confident that the black outline and red hearts will be easily be broken down. I hope to fade some of the colours, neither one of these birds, would achieve total removal due to the high amounts of yellow and green pigments in the colours. 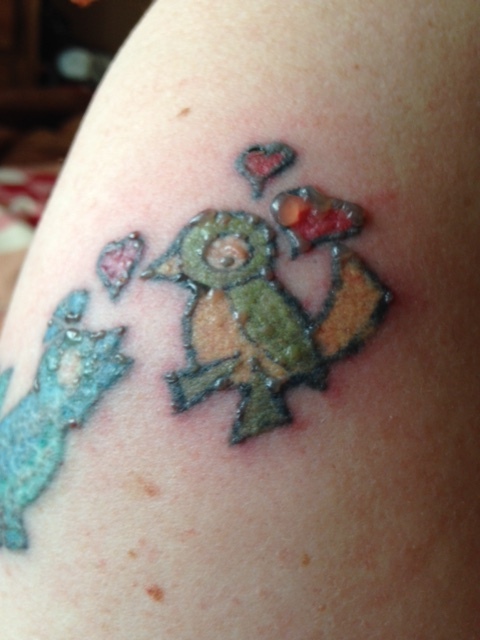 But if I can fade them slightly I won’t have to compromise on the new design. The laser session took no longer than 10 minutes, using the 1064nm lens to focus on breaking down the black outlines and the 532nm lens to focus on any red pigment that may be present. The laser felt like an elastic band hitting my skin [repeatedly], it wasn’t particularly comfortable but was not unbearable and was over quickly. I found that the 532nm lens felt sharper and pricklier than the 1064nm lens. As soon as the laser stopped the tattoo felt stingy as if the area had been slapped quiet hard. The icepack was very welcome and helped to cool and ease my skin, I continued to keep the area cool for a couple of hours in the hope that it would reduce any bruising and lower the chance of blistering. Straight after the session I applied a thin layer of Water-Gel. This is a pain relieving gel, which helps to cool and soothes the skin along with having an antibacterial quality to help to prevent infection if the skin has been broken. My skin didn’t break during the lasering process but I don’t know if it is going to blister so I am using an antiseptic cream. This morning there were a couple of small blisters. The surrounding area still slightly pink, sensitive but not tender to touch feeling like mild sunburn. But by 9pm the blisters had disappeared. I am still using an antiseptic cream, just in case the skin has broken to prevent infection. The tattoos are still slightly raised, but are not tender to touch. Decided that as my skin hasn’t broken that its time to start to use a moisturiser. Moisturiser will help to rehydrate the area.